UK shares opened lower on Friday, but the declines were not as big as those seen in Asia and the US. The benchmark FTSE 100 share index fell 39.59 points, or 0.6%, to 7,131.10. Asian markets saw hefty falls overnight, while in the US on Thursday the Dow Jones fell by more than 1,000 points for the second time this week. The big sell-offs around the world this week have been pinned partly on concerns over the prospect of higher interest rates. In Asia on Friday, Japan’s Nikkei 225 shares index closed down 2.3% while China’s Shanghai Composite slumped 4.1%. Kamal Ahmed: Will the fall turn into a rout? In the US, the Dow Jones ended Thursday’s trading session 4.2% lower at 23,860, and the wider S&P 500 index closed down 3.8%. Thursday’s declines mean the Dow and S&P 500 have now fallen by more than 10% from the record highs set in January, a threshold that analysts call a correction. However, the falls seen in early trade in Europe were not as steep. Germany’s Dax index slid 0.3% and France’s Cac 40 index was 0.4% lower. 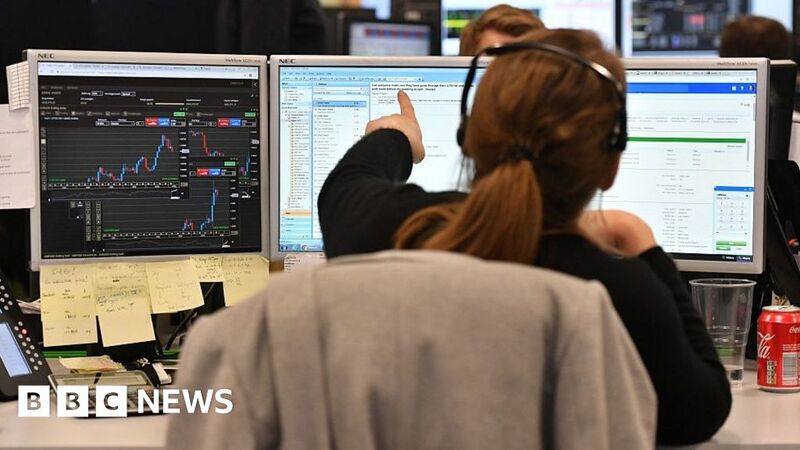 Sue Noffke, UK equities fund manager at Schroders, told the BBC that given how well stock markets have been doing for the past few years, the sell-off this week was not that unusual. “In the context of the rises we’ve seen, certainly this kind of pull-back of 5-10% is quite normal for markets – it just hasn’t been normal for the last couple of years where we’ve seen very low levels of volatility and very small levels of weekly or monthly moves. The global sell-off began last week after a solid US jobs report fuelled expectations that the Federal Reserve would need to raise interest rates faster than expected, because of the strength of the economy. That concern has prompted the pullback from stocks. On Thursday, the Bank of England seemed to offer support for the view that rates in general are on an upward path. The Bank left interest rates at 0.5% at its meeting, but said a strengthening economy meant interest rates were likely to rise sooner than the markets were expecting. Also worrying investors was a government budget proposal announced by US lawmakers, which raises spending caps and could fan inflation. At the same time, higher interest rates can make investment alternatives to stocks, such as bonds, more attractive.